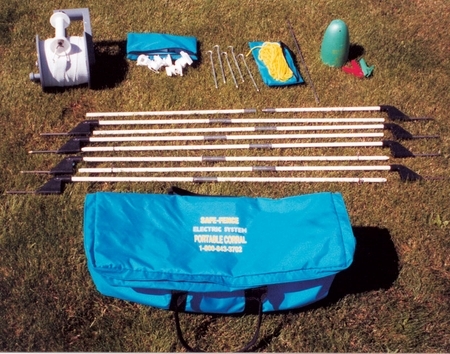 This is a great portable corral kit. 50 x 50 ft.; made with 200 ft. of Safe-Fence 1 1/2" webbing on the R-18 rewing reel with 8 x 2 piece treaded posts. The HP-B2D Trail Charger and tie downs all in a packable 24" carrying bag. Made in the U.S.